John Paul Strain Hand Signed and Numbered Limited Edition Giclee:"Skirmish At Toms Brook"
Image Size: Paper 19 x 28/ Canvas: 16" x 24, 25" x 31" and 26" x 39"
About the Art: Colonel Turner Ashby was the most skilled horseman in the Confederacy. Known as the "Black Knight" before the war, Ashby had won many equestrian events throughout Virginia and rode a large white stallion named "Tom Telegraph". In the early morning fog or on moonlit nights, Federal troops described a ghostly figure on a white horse moving along the hilltops and ridges of the mountains; it was Ashby. Federal leaders were constantly concerned about Ashby and his raids. One of their commanders complained to a cavalry officer about the damage Ashby and his soldiers were doing to the army. The officer replied, "I can't catch them sir. They leap the fences and walls like deer. Neither our men nor our horses are so trained." Such was the case in the Spring of 1862 when General Jackson relied on Colonel Ashby to cover the withdrawal of his army up the Valley Turnpike, with the Federal Army under General Nathaniel P. Banks in pursuit. Jackson's army had lost their first engagement with the Federal Army at Kernstown and was now vulnerable to follow up attacks. Ashby's cavalry had about 26 companies together with Chew's battery, to slow the enemy's advance. Their constant assaults and flanking maneuvers were conducted masterfully. One of the key skirmishes took place around the little town of Toms Brook on April 2nd. Using the stream and steep terrain to their advantage, Ashby and his men so rattled General Banks, that his advance stalled and would stop at the village of Edinburg. 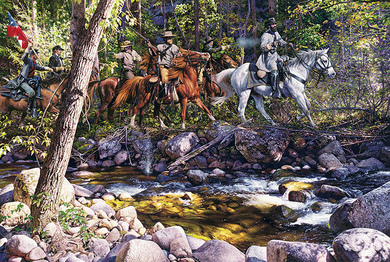 Thanks to Ashby, Jackson's Army was now able to fall back to the strong position of Rude's Hill outside of Mount Jackson to regroup in safety. -J.P.S.